There’s a delicate dance for all of us who rely on natural light for photographs. For small projects like socks or handspun skeins of yarn I can get a decent photo in almost any weather, but sweaters and larger shawls are more complicated. For me, if I want to get a picture of the whole project that requires larger than about a 2’x2′ space, I need decent weather so I can snap the photo outside. This April in Wisconsin has involved a lot of snow and rain and raining ice and sleet, often in quick succession. It usually does, but ideally there’s a bit more sunshine in between so I can sneak outside to snap some quick photos. I bring this up because I’ve got a sweater & a shawl all ready to share with you and I’m waiting, ever so impatiently, for a break in the weather. Soon, my friends, soon. In the mean time, I thought I’d share a WIP update because I’ve been attempting to lurch forward a bit in what I’m working on. I’m ecstatic to report that last night I wrapped up my Three Waters Farm March Top of the Month Club braid. Named “Spring Spirit” this certainly is made up of many of the colors I see out my window (although it’s missing the white snow — lol!). I see irises and green grass and the tulips leaves and the first crocuses of the year. 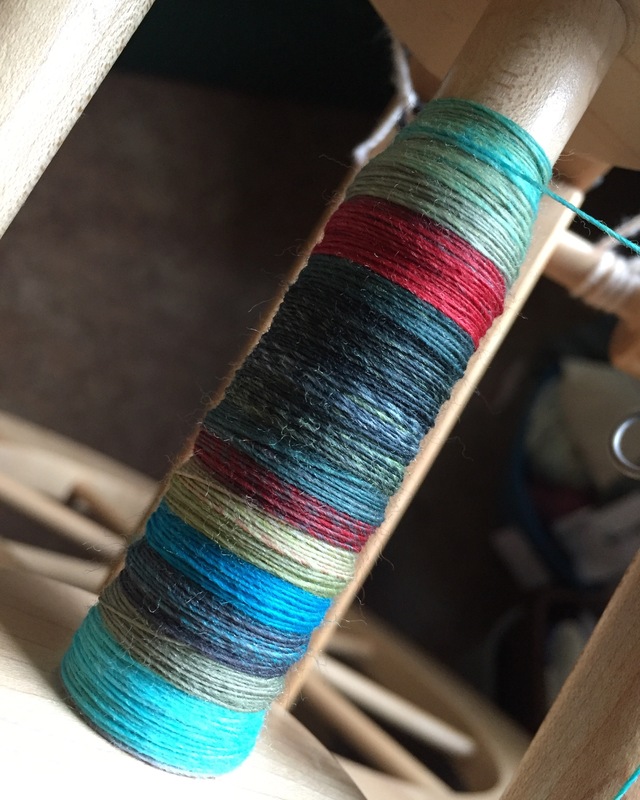 I did some playing with the length of color repeats on this spin & plan to n-ply it. If I get the yardage I need, I’m thinking this will be earmarked for a Quaker Lines shawl. With just 4oz and making a 3-ply, I’m not confident I’ll have the yardage though, so we’ll have to wait and see. Because I like to be ready to hop right into my next spin, before finishing it up I managed to prep my January Top of the Month Club braids, also from Three Waters Farm. I’ve been aiming to stay up to date with my club subscription and so far this is the only one I haven’t spun. You know me, I’m not big on loose ends, so to ease my own mind I really had to make this spin happen. 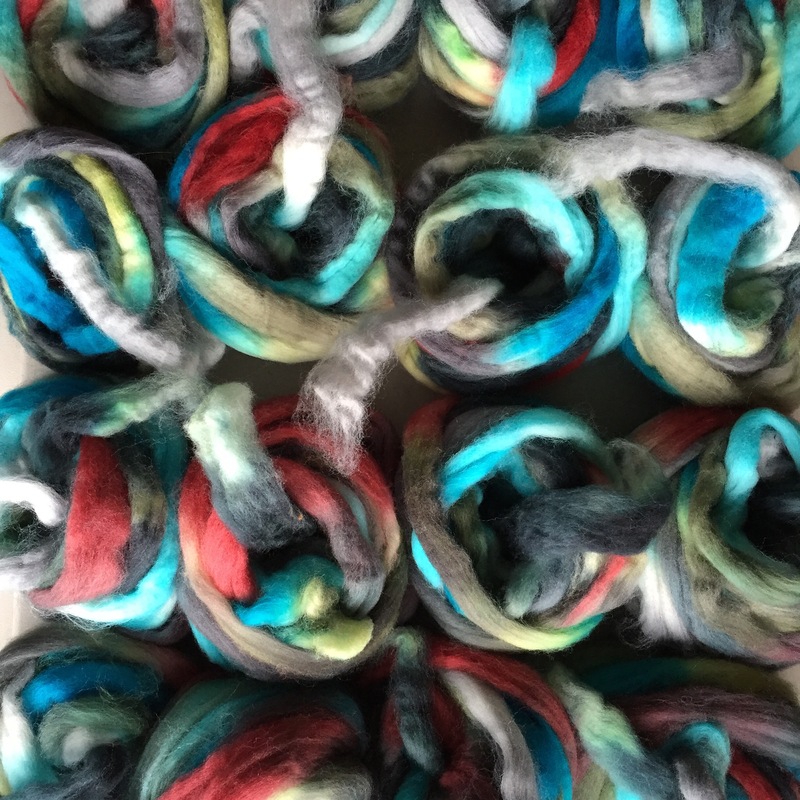 There’s an extremely talented spinner named Karen in the Three Waters Farm Ravelry group who is famous for her gorgeous barberpoley skeins and a while back she was kind enough to share how she preps her yarn for maximum barberpoles. I was really indecisive about how to handle this gorgeous colorway, named “Birds in Holly”, so to end my own over-thinking I decided to try my hand at her technique. To see why I’m interested in trying Karen’s technique, please check out her handspun in her Etsy shop. In addition to her handspun yarn, she also has some cute stitch markers and select spinning tools for sale. This morning after my morning yoga I got right to this new project. 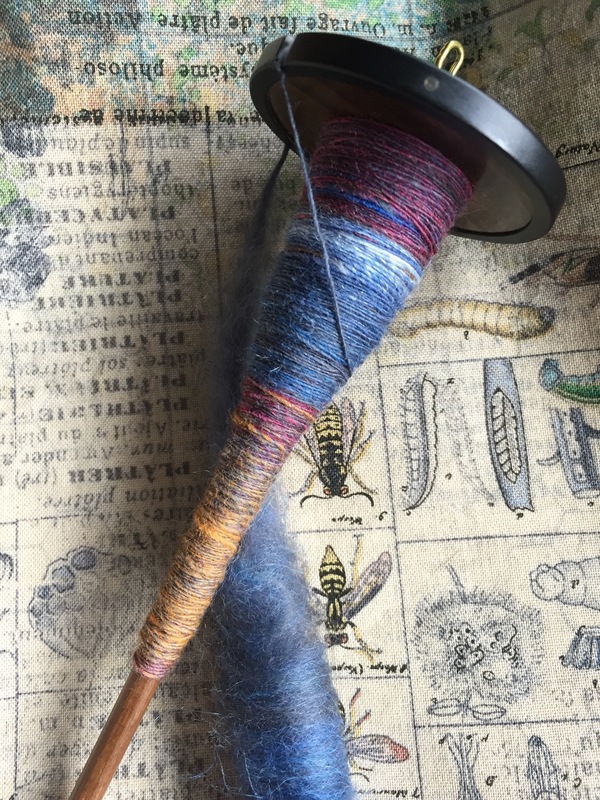 I’d considered spinning it a little heavier and this Rambouillet is definitely going to be a bit more substantial than the Falkland of ‘Spring Spirit’, but this weight feels right to me so I’m just going with it. I adore the colors already. 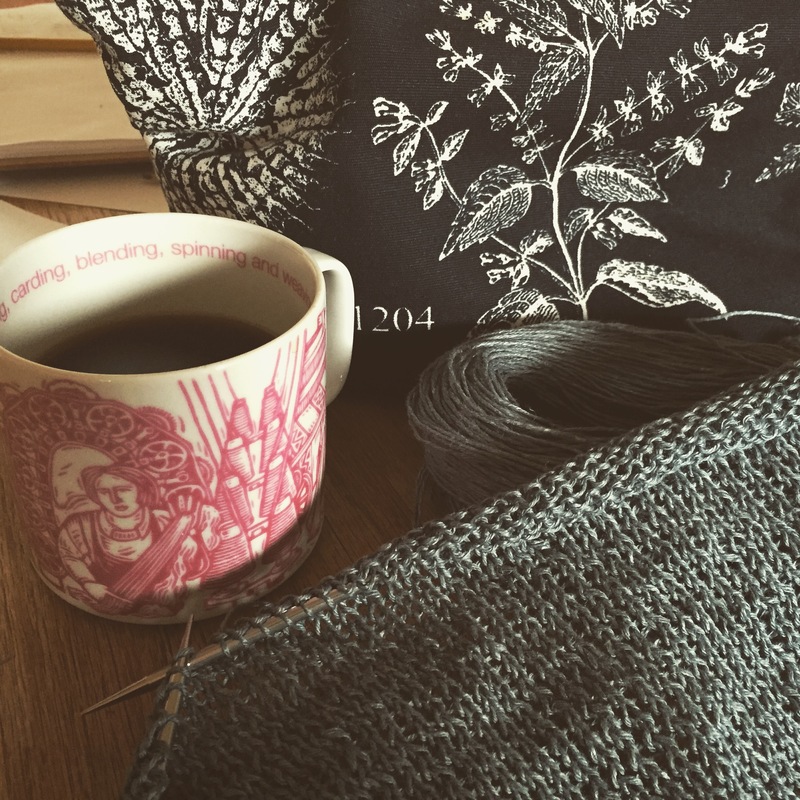 In my knitting, I’ve forbidden myself from starting any of the FOUR projects I’m itching to cast-on until I finish my Veleta top from the new Louet Spring Collection. Both sides are knitted identically and I’m a little over halfway through the big stockinette block of the second side. So motivated, I even made myself an Americano yesterday after lunch for a little extra boost. As I knew I would, I’m really enjoying knitting with Louet’s Euroflax Sport. I chose to knit this top in Heron Grey with the bottom lace accent in Cream. It has a very old world feel to it that I truly adore. 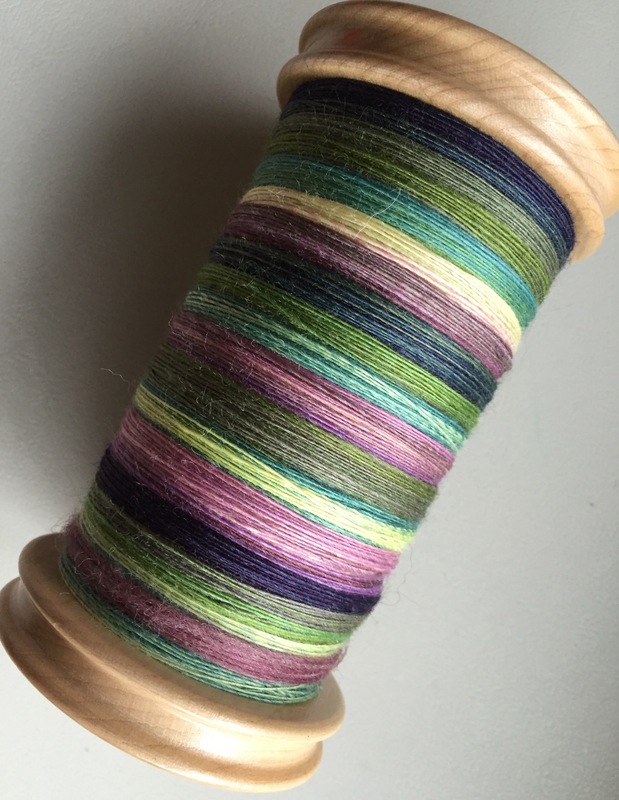 Last, but certainly not least, I’ve been plugging away at my spindle spinning project. I’m definitely still learning how to use this tool efficiently, but I’m very happy to be making progress on this previously stalled out fiber. I’ve been aiming to spin up between 1/2 of a rolag and one full one each day and that seems to be do-able for me. As I continue to wait for the weather to behave so I can share those FOs, I’ll just keep on keepin’ on with my WIPs as I always do. I suppose the silver lining of the uncooperative weather is that we tend to stay a little closer to home, so I have a tiny bit more time with my knitting & spinning. As I watch the fine snow that is falling outside change to rain and then to ice pellets and then back to snow, I’m going to just keep telling myself to think of that silver lining. Yes, I’m just going to knit & spin my way to more agreeable weather. The Wisconsin weather has certainly been fun! Snow, then 60 degrees, then cold, then rain and a sprinkling of sunshine, in between. Can’t wait for the weather to cooperate so we can all see what you’ve been up to. Fingers crossed but probably not tomorrow. ❄❄❄ in the forecast! You’re so right! A fresh inch was waiting for me this morning. LOL! Michigan weather has been the same! Never a dull moment in Spring in the Upper Midwest, right?! No snow, but it’s been cold here in Maryland. The temperature has been hovering in the 20s most nights, and struggling to break 40 during the day. Today it broke 50. Your handspun yarn is lovely! Absolutely stunning! Plus, you get everything so neat and even on the bobbin. My bobbins are always kind of a mess. And yes, I remember those so-called “springs” in Wisconsin! I’m the first to admit that I’m more than a little fussy when it comes to my bobbins. I swear I’m kind of like a human woolee winder!